Slice the squash in half, lengthwise. Scoop out all the seeds with a spoon, set aside for roasting, if desired. Roast for 20-30 minutes, until it is soft to the touch. No salt or oil needed. Meanwhile in a small saucepan set over medium high heat, add water and 1 teaspoon kosher salt. When boiling, add millet and rice, cover and reduce to simmer. Cook for 20-25 minutes until you see little holes for fluffiness. In a large saute pan set on medium heat, add oil, and Earth balance spread. When melted add diced onions. Toss to coat onions well for a minute. Then add the cinnamon stick, curry, cumin, cinnamon. Combine well. Add diced apples, stir for 2-3 minutes until just beginning to soften. Add kale, swiss chard and remaining 2 teaspoons kosher salt. Toss well (I use tongs to grab and turn over big leafy greens, no mess). It will look like a huge amount in the pan but it will shrink within a minute. Add radicchio, and cranberries. Combine well. Cook for another minute until greens have softened but still have a little firmness. Add tamarind paste, and pepitas, mix well, cook another minute until done. Add the millet/wild rice mixture to the pan, mix. Scoop stuffing mixture into the halved delicata squash shells. This Stuffed Delicata Squash is a complete meal. The delicata squash is a mild, sweet tasting squash, similar to a sweet potato, filled with millet, apple, cranberries, kale, pumpkin seeds and more. 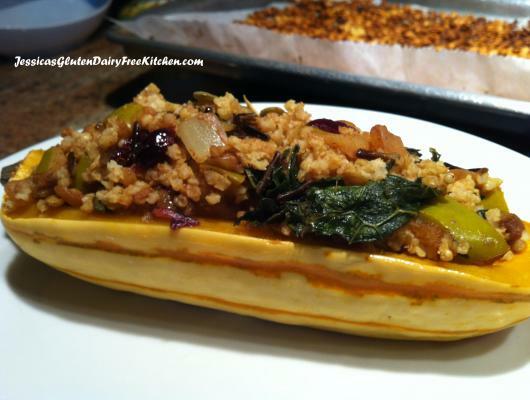 It's a fall harvest of foods combined into a hearty and delicious gluten free, grain free, vegan meal.